During the winter months, dishes like soups and pastas often make you feel very warm and cosy inside. 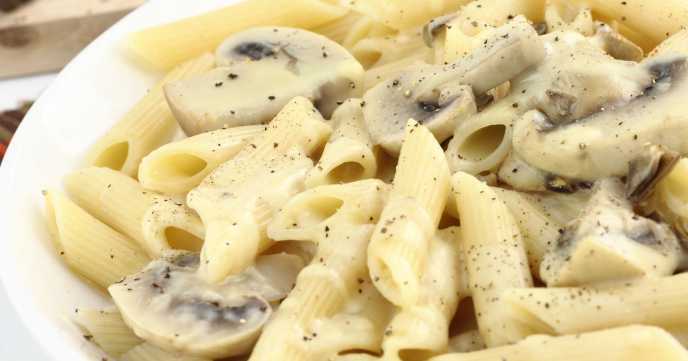 One of my personal favourites is a creamy mushroom pasta – not only is it deliciously creamy and filling, but the mushrooms give wonderful earthy undertones, making this one of my all-time favourite dishes to eat when the snow starts falling! Place your pasta in a pot of boiling water. Add a pinch of salt and leave to cook as per package directions. Add the crushed garlic and sliced mushrooms into a frying pan with a splash of oil. Fry for five minutes or until garlic is fragrant. Add the diced onion to the pan and fry for a further two minutes before adding the vegetable stock. Bring to a boil and leave to simmer. In another large pot, melt the butter. Once it is melted, stir in the flour. Slowly whisk in the milk. Add the mascarpone cheese and mix it until the sauce is smooth. Bring to a boil and simmer for 5 minutes. If the sauce gets too thick, add more milk. Add the mushroom and stock mix to the pot. Mix well. Add pasta and mix so it is all coated. Serve topped with a dash of grated parmesan cheese or other hard cheese alternative. January 15th, 2019 at 01:30pm, nearly witches.